Martin Williams was rector of Eversholt from 1578 to 1579.
provides the record of Williams’s arrival in and departure from Eversholt. He was appointed because the previous incumbent, Maurice Faulkner, died. * Mandate to A., Bedf. So, Maurice Faulkner died – in what circumstances is not clear. Martin Williams took over, presumably as a stopgap. Strangely, his patrons, who would normally be possessors of the advowson, were Charles and Dorothy Morisin, while the patron of both his predecessor, Faulkner, and his successor, Gibson, was Queen Elizabeth I. Quite what that means is entirely obscure. Williams resigned after one year. Here’s wikipedia on the Morrisons. is included here for want of anywhere better! There’s no obvious connection with Eversholt visible. 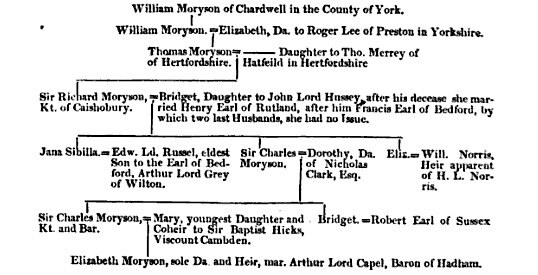 The Morisin family were granted lands by Henry VIII after the dissolution. The manor was called Cashiobury orCassiobury. The Peerage has a slightly different story, including spelling the name Morrison. Charle’s stepfather was Earl of Bedford at the time of Martin Williams’s appointment – maybe there was a connection with Eversholt there. King H. VIII. who by Letters Patents dated the 20th of Aug. in the 37th Year of his Reign, conveyed to Richard Morisin, Esq. this Mannor of Caishoebury, Court Leet, View of Franc-pledge, Goods, and Chattels, waifed Goods, and Chattels of Felons and Fugitives, Felons of themselves, Deodands, Estraies, Liberties, Emoluments, and Hereditaments whatsoever, in as large and ample Manner as the Abbots held the same. After his Decease this Mannor came to the Possession of Bridget his Widow, who enjoyed it; and An. 1561, 3 Eliz. married Henry Earl of Rutland, who was made Lord President of the Council for the Northern Parts of this Realm in the same Year, and installed Knight of the most noble Order of the Garter, during whose Intermarriage, Courts were held in both their Names for this Mannor: He died without Issue by her upon the 17th of Sept. 1563, 5 Eliz. after his Decease she married Francis Earl of Bedford, who died without any Issue by her, on the 28th of July, Anno 1585, 27 Eliz. in the 58th Year of his Age: Afterwards she died the 12th of Jan. Anno 1600, 43 Eliz. and in the 75th Year of her Age. Upon her Decease this Mannor descended to Sir Charles Morisin, Knight, Son and Heir of Sir Charles, who was made a Baronet by Letters Patents dated 22nd May, 1611, invested with the honourable Order of the Bath at the Coronation of King Charles I. in the year 1625, 1 Car. I. He served for the Borough of St. Albans in the Parliament held at Westminster, 17th of May, 1 Car. I. For the Borough of Hertford, in the Parliament held 1628,4 Car. I. And for this County in the Parliament held 21 Jac. I. He married Mary the second Daughter of Sir Baptist Hicks, Viscount Cambden: He gave Or, on a Chief Gules, three Chaplets of the first; and died on the 20th of August, leaving only Elizabeth, his sole Daughter and Heir. From whom this Mannor is come by Right of Inheritance to Algernoon Earl of Essex; of whose noble Family I have already treated in the Parish of Little Hadham, to which I refer the Reader.